WILD/WALLED is a daring contemporary dance piece exploring the barriers put on us by society and the “wildness” within us that fights against them. It is produced by Half Second Echo in association with Alison Daley and Tracy Norman. WILD/WALLED has got some major guts and I don’t say that lightly. The performance quality was of a professional caliber. Every dancer was as equally focused and present as the next. The ensemble was connected in an “other-worldly” way. No move out of place. No moment unnoticed. There wasn’t a single weak link in the cast. A solid group of dancers who clearly have done a step or two in their day. I was especially impressed with Denise Solleza, whose focus you could pretty much cut with a knife. Nikolaos Markakis was also a stand out. His movement was quite simply fearless. The group as a whole were so in tune with each other, it was almost as if they were all connected to the same consciousness. It’s not everyday you get to see something like that — it was really cool to watch. There were a few moments in the show that shot chills up my spine, such as when the entire group collapsed into a dog pile in a single swipe, or when the dancers threw themselves against a plastic sheet which I gathered was the “wall” to their “wild”. 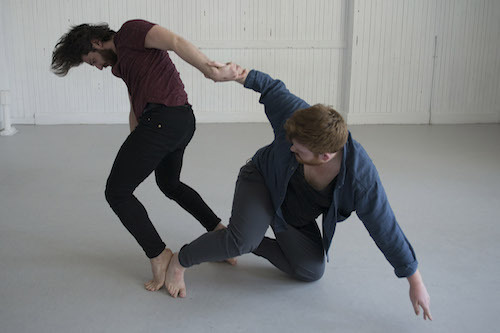 What I really liked about WILD/WALLED as a contemporary dance piece in particular is that it didn’t stop moving. Even the slower moments were met with such presence and intensity that you couldn’t look away. That’s what really sold the show to me. It was pure, unadulterated emotion. I wasn’t really able to follow a story, but I don’t think that was their goal. The concept of wild vs walled was prevalent throughout, and I later found out that the piece itself was choreographed by three different choreographers in Alison Daley, Miles Gosse and Tracey Norman, each giving their take on the theme. My favorite piece was easily the first one which utilized props such as styrofoam balls, bricks and a huge sheet of plastic in ways I’ve never seen before. WILD/WALLED is worth more than the ticket price in my opinion. The quality of performance is out of this world with choreography that speaks louder than words ever could. Check it out at the Toronto Fringe Festival and prepare to get captivated. Photo of Nikolaos Markakis and Miles Gosse provided by the company.